VANCOUVER, Canada—Mona D’Amours and Desiderio Fortunato know dance. Both former dancers, they are also the founders of the Dance World Cup in Canada which has seen over 8,000 dancers from around the world compete since 2010. 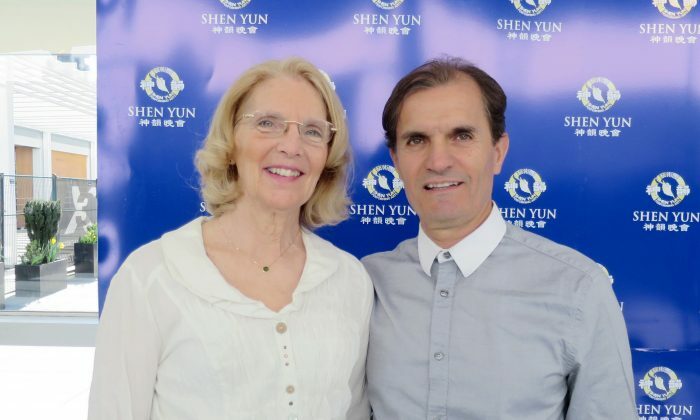 D’Amours’s motto is “diversity is the key to success,” and so she was thrilled to see the traditional Chinese dances as performed by Shen Yun Performing Arts. The New York-based company is the world’s premier classical Chinese dance company, and classical Chinese dance forms the foundation of every Shen Yun production. Each performance also includes dances in ethnic and folk styles—like that of the China’s Yi people, or Mongolian ethnic dances—accompanied by a unique orchestra blending sounds of East and West. “It’s excellent,” said D’Amours, who Radio Canada International has named “the driving force behind Canada’s dance competitions,” and has organized such events since the 1990s. “As we become more global we have to expand our repertoire as dancers and that is what they have done through this show,” D’Amours said. D’Amours remarked on the expressions on the dancers, and the sheer athleticism she saw in the movements. Classical Chinese dance, developed over millennia, is one of the most comprehensive dance systems in the world. The form includes difficult tumbling and aerial techniques—which the couple especially could appreciate because one of their children, all three who dance, got started in the aerial arts. But classical Chinese dance is also expressive in nature, emphasizing “bearing,” or a performer’s inner thoughts and the feeling behind each movement, lending itself to be an adept form for storytelling.